Today was... wonderful. I am smiling as I write this. You know how some days are just plain crummy for no real reason, and you just have to resign yourself to getting through to bedtime so you can kiss the day goodbye? Well this was exactly the opposite :) And speaking as someone who has had a couple of those crummy days recently, I am happy to report that today was FABULOUS. REASON #1: Language school was awesome. Our weekly class schedule is as follows: Mondays we are in the classroom and we focus on conversation. Wednesdays we walk around town and she talk to us in French about everything we see. Thursdays are back in the classroom and we talk vocab and grammar. Today was a walk-around day. So fun! I love it because the day is more informal and the class can talk together. I really enjoy the women in the class. They are so kind. The day was gorgeous as well. We visited the Hotel de Ville (civil offices). It's the big pretty building in the center of the Grand Place that I have always wanted to go in. I thought it was a hotel for awhile (I wonder why..) and was a little disappointed to find out it is just offices. This room is where the civil part of marriage ceremonies take place in Huy. And here's a view out the window into the Grand Place. I love that place. It is the epitome of Huy to me. Did I mention the day was beautiful? This is one of the oldest houses in Huy. I love it because you can see on its surface how many changes have been made to it. Look at the pattern in the brick. I love the story it tells. Such history here! Our class tromping through le vieux Huy (old Huy). REASON #2: We will be playing Carcasonne tonight... YES, we found Settlers of Catan AND Carcasonne yesterday! Can you believe it? May Clay never give me a hard time about dragging him into stores again. We were checking out a toy/craft store when he found the games. It was like finding the Holy Grail- Indiana Jones kind of stuff :) We were so happy. REASON #3: The guy at the market gave me free stuff again today. A bunch of leeks and 2 bananas. Free vegetables?! That is awesome. REASON #4: There are plants on my kitchen windowsill. Little red flowers, basil, and...wait for it.... CILANTRO!! I learned the other day that cilantro seeds are coriander (bear with me, garden people), and today while at the market I saw coriander plants! The stalks are a little wimpy, but I am going to nurse those puppies back to health and make us a taco soup to beat the band! What a wonderful day! I am now going to dig through my market finds and cook dinner. Life in Huy is good. Praise be to God for giving us wonderful days! Clay got to make his first 'baguette run' before lunch. It was so euro :) Running across the street for bread. Perfect. We had s'mores for dessert- you can't beat that. And fire always makes things extra fun. This week is our first "normal" week here since we now have a routine somewhat in place. It is good to get settled in. The view out of our windows is getting more and more beautiful as spring greens are popping up every where. Amy, Daisy, and I went on a walk this morning. Ah, spring! You're here! It was such a beautiful start to the day. I thought you might like to see a little of my new town. This a view from the main bridge through town. We walk across it multiple times a day. The famous cathedral and fort of Huy. This is taken on the same bridge but looking the other direction. One of the main streets in Huy. Brent and Daisy live on this street. One of my favorite houses. Right on the river and in the center of town. What a beautiful morning in Huy! Whenever I see that church roof on the hill, I just want to GET to it. Isn't it just so mysterious and cool? Amy said it is over 1000 years old too. I will get there one day. The far bridge you see is that main one again. The one we walk across daily to get to the train station, the church, the grocery store... basically everywhere. The blue building in the front is my main grocery store. First day of language school today. I know what you astute ones are thinking.... language school started YESterday, Megan. Oh contraire. We went to school yesterday, but it didn't start yesterday. And it didn't start today either..it started MONDAY. Yes, we missed it. I am not surprised in the least :) So we went yesterday only to find out that we needed to come back today. Sheesh. Did you ever have those friends whose last week of summer was marred by their moms making them practice waking up early so they would be ready for it when school started? That is exactly what yesterday felt like! We got up early, had breakfast, chose our special "first day of school clothes" (ahem, first impressions are important), left the house to walk to school... and then came right back home (and put back on my pjs- those "special" clothes ended up in a rejected heap on the floor). So... today. We went back and found our class (thank you God!). This first day was pretty cool. We took a walk around town with our class and the teacher explained things in French to us. We went to the market and learned vegetable and fruit names, etc. It was overwhelming (of course), but good. The class is made up of people from about every country you can imagine. Seriously. Turkey, Brasil, Tunisia, Chechnya, Albania, and the list goes on. So incredible. We are the only English (native) speakers, which is a huge blessing as well. No temptation to break out in English! Eventually there will be curtains to block out the blinding afternoon sun, but for now we shall squint. Today was my (Clay) first race with the team, which calls themselves Les Foulées du Plaisir (which means "The Crazies for Pleasure", i.e. running is fun and we're crazy about it - it sounds better in French). It was awesome. The course was a beast, but pretty fun. A lot of hills, and quite a bit of mud. And when I say quite a bit, I mean a lot. 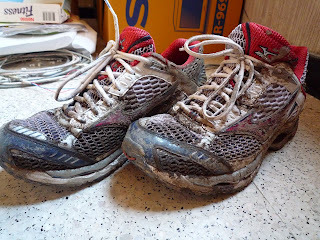 But who wants clean running shoes, right? These races are really cool. Sprimont, the town that hosted the race, is a quaint little town with lots of hills and interesting buildings. Quite a few people who lived along the route were out in their yards watching, which makes for a cool atmosphere. The trail started in town, then across a really muddy field, then up a miserable, muddy, steep hill that had a stream running down it on parts of the trail. By far the most difficult running condition I've run in. I'm glad there where other runners around, because if I was by myself, I would have bet money I was no longer on the trail. Later in the run we crossed this really neat foot bridge in the woods over this beautiful little stream. Some of the other views from the tops of hills showed some of the most beautiful Belgian countryside I've seen yet. It was great to round the last corner and see Fredie and Jean-Luke, guys from the team who'd already finished, saying "Allez Clay!" We had a good time, and hopefully this won't be my last race with the group. For those who enjoy running, technology, or both, check out the run as tracked by my groovy watch/GPS. Nay, it is permission to feel at home. So, GREAT news. We have internet. Which means I can share some photos! Which makes me really happy because a lot of the times pictures give a better feel for reality than words. Get ready for a lot of photos! We then had pitas an watched a movie. Oh, the comforts of the familiar. Thank you for coming, Friend. I needed you. Easter! We had lunch after church with our pastor's family. Here are 3 generations of women in their family preparing lunch. I love it. It made me think of the WWAC (you know who you are) and how much I love them. I miss you! Clay is being silly here, but I really just wanted to show their backyard. So beautiful! Spring is definitely here. I am enjoying getting to know Daisy! She has a lot of wisdom having been exactly where I am just 18 months ago. Yesterday, I went with Daisy to hang out with her friends Sirin and Xavier. We decided to drive up to The Netherlands for a couple of hours (rad, yes? ), and got to see a lot of beautiful Belgian countryside on the way. Just gorgeous. Something else funny is this restaurant. When we rounded that corner, I felt kind of strange. Then I turned around and noticed that ALL of the tables and chairs of this cafe were facing the street. They were all just LOOKING at us. So unnerving. It was funny. We headed back home, had some yummy Turkish food (Sirin is Turkish), and relaxed. So fun! I really enjoyed my time with these new friends! So gracious! I hope to see them again soon. I thought you might be interested in seeing the view from our living room (and bedroom, too, for that matter). So ridiculous, right? It is perfect. We love being able to look out and watch life happen here. And, you guessed it. MacGyver has been making some appearances here in Huy :) Something about this show calms me and makes me feel at home. I love it! Going to the market every week has been so much fun! I look forward to it each week. I just got home from my trip a few hours ago and got some soup going. I have never cooked with leeks before, but they are everywhere here! Notice the new paint color in the kitchen, too. I will take some pictures of our apartment soon, so you can see the progress. It is looking so nice. Wanted to share that the last few days have been better. Thank you so much for all of your encouraging comments and emails. Adventures like this aren't always pretty, so thank you for praying for and loving me. So, a good day. I learned something new, and I made it back home. Tomorrow is market day so I am excited about that. It is wonderful and right outside our building. So many beautiful fresh veggies- I can't wait! Oh, and for those of you following my culture-shock-induced regression, here is the latest. Word mixups. Just now at dinner I suggested to Clay that we "watch a game or play a movie" and then yesterday I asked him "What color is it?" Instead of "What time is it?" Sheesh! Love to you all. Thanks for supporting me through the tough times. Put the ingredients in a blender (or use a nifty hand blender) and blend until smooth. Eat immediately or, even better, chill for a few hours letting the flavors meld. This is how I ended up in bed. The covers would have been over my head if we had curtains. The afternoon sun is so hot in our room, that the desire to breath was stronger than my desire to hide. At the risk of sounding whiney, I will say it again. THIS IS HARD. The day did improve however. Clay peeled me out of bed (my bed with TWO fitted sheets because I can't say 'flat sheet' in French either...oh bother), and we walked to the second hand store. I LOVE the second hand store. So much junk to dig through. And so many treasures to unearth. Well, guess what happened on this crummiest of days? We found a couch! I am so happy. It is perfect. It even folds out into a bed for all of our guests (hint hint). We have to pick it up within 8 days so hopefully we will find help to get it home before then. We are crossing our fingers that it can go through the doors this time. Furniture through the windows can be stressful for this American. Atleast when she is stressed enough as it is :) We also found a crate for my microwave/oven to sit on. You see, I have had this oven for over a week, but I couldn't get it open because the fridge was in the way on one side, and the stove top controls on the other. Anyways we found a crate that will support the oven off the floor under the counter. I am so happy. Tonight I cooked dinner, and I felt like the kitchen had grown so much just by moving that oven off the counter. Hurray! Another bright spot is that tomorrow is Easter. Oh how happy I am to have Jesus! The bells are sounding as I type this. It seems to be a special performance for Easter Eve. They have gone on forever. Just loud and boisterous. And resounding. It is getting to me! To be so filled with Christ's joy, that it peals out like bells on Easter Eve. That is how we should live. Today was kind of crummy. And then it got better. Jesus was there for all of it. He cheers me on. And corrects me. And loves me. Ring the bells! He is risen! Pictures of life and our apartment to come soon. We don't have our own internet at the moment so I haven't felt like I could upload pics. Here the men are working on their strategy. And we're off! We were trying very hard to avoid our downstairs neighbor's windows. We have been VERY busy painting! The bathroom is the only room left- we will be so glad when that is done. The first night we were painting the Jr. High group came by and introduced themselves. So precious. They were our first visitors- it made me so happy. I offered them Melocakes (another Belgian food that is sooo good) and American Easter candy that Mom sent from home. I wish you could have seen Clay's face when one kid took a Cadberry Egg. Ha! Few things make one as protective as when their Cadberry Egg is in jeopardy. This is a sign we saw on the train the other day and it sums up how I have been feeling. So many questions! And, SURPRISE! Jamie Lamb is here from Austin. It is soooo good to have her here!! She makes me laugh- such good stress relief :) She is a delight.